I’m over 30 weeks pregnant with twins now and I am starting to feel it! My workouts are also changing due to my growing belly (it’s nearly the size I was at 41 weeks with my daughter), inability to lay flat on my back (I get dizzy and uncomfortable quick), and the fact that climbing one flight of stairs has me huffing and puffing (lung capacity is decreased by 25% at this point in pregnancy and I have 60% more blood to pump through my heart each day). I’m also increasingly aware of the risk of diastasis recti with twins and am taking fewer risks when it comes to movements that promote it (although in many cases there’s not a lot you can do to prevent it). But all those things don’t mean I’m giving up all exercise – it’s just changing! I love exercise too much and it’s too beneficial to throw in the towel now. However, I have been thinking a lot more about the purpose of everything I’m doing. 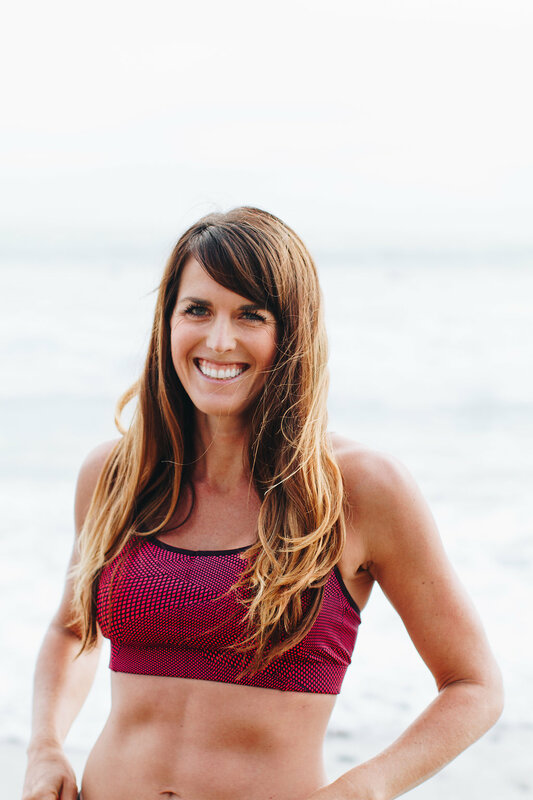 I’ve also had a few discussions with my fellow twin mama and certified prenatal yoga instructor, Ashley Wolfe, about what pregnant women should and should not be doing exercise-wise this far along in pregnancy. Since there is SO much conflicting information on the internet, it was nice to hear it from someone who has authority in the subject. You can read her insightful blog post on her blog Fuel Your Zen about how to adjust your yoga practice through all three trimesters of pregnancy here (even if you don’t practice yoga you’ll get something out of this). After taking all of this into consideration, I’ve been making changes. That being said, every pregnancy is different and every woman is different. That’s a big reason why there’s so much conflicting advice on the internet – plenty of women have done planks and ran until their due date with no complications at all! And plenty of women have stopped running as soon as the little line showed up on the stick because they simply don’t feel comfortable doing so. Listen to your body, talk to your doctor, do you research, and do what works best for YOU. Focus on Prenatal Yoga. I’ve been doing a lot more prenatal yoga lately and it feels GREAT. I love connecting with my babies, knowing that I’m doing moves that specifically focus on pregnancy ailments, and, in the case of the live class I’ve been attending every Friday, meeting fellow pregnant moms. This month’s challenge in my Healthy & Happy Pregnancy Support group is a prenatal yoga challenge and the goal is to do 10 prenatal workouts this month and track them in our group. The other night I did a simple 10 minute prenatal bedtime yoga routine I found on YouTube and loved it! I also really enjoy the prenatal yoga workouts on Beachbody on Demand (there’s one for each trimester). I’ve found that prenatal yoga gives me the feeling of having done a workout but doesn’t completely tire me out – something that’s key at this point in my pregnancy! Saying Goodbye to Moves That Could Cause Diastisis Recti. I didn’t experience diastasis recti (separation of the abs) with my first pregnancy but it’s a lot more common with twin pregnancies so I’m trying to be more cautious. The moves I’m avoiding include front planks (I eliminated crunches a long time ago), all jumping, and any pose that involves stretching my stomach forward (back bends – this was a tip from my prenatal yoga instructor as well as Ashley). I’ve also decided to stop doing push-ups, even on my knees, as I do see a bit of coning in my belly when doing so (instead I’m using my yoga bolster to do chest presses). Plus, honestly with 35 extra pounds they are freaking hard even on my knees! I’ll note that I’ve been avoiding any deep pelvic twists from the very beginning as I was warned to avoid them by a yoga instructor during my first pregnancy. Hiking and Walking Instead of Running. Yep. I think I’m done running. I made it WAY farther than I expected. Last Saturday I ran with my friend Kelley and things just felt kind of terrible. Luckily she’s pregnant and also was feeling crappy so she was fine walking a lot. But I just kind of came to the conclusion that walking and hiking feels a whole lot better than running, so why push it at this point? I could keep running for a few more weeks (I’ve been lucky to not experience much belly or pelvic pain while running), but I don’t think I want to anymore. I feel good about the decision. Pretty sure this was my last pregnant run! Shifting to More Beachbody on Demand Prenatal Workouts. Although I know how to modify most of my other favorite Beachbody workouts (Dirty 30 Extreme is still my favorite and in regular rotation), it’s nice to just be able to do a workout knowing I can actually do all the moves! There are 4 prenatal strength workouts on Demand so I have a few choices! More Rest Days. Last week I didn’t exercise on Monday or Tuesday, not even a walk. I just wasn’t feeling it and decided it was better to just listen to my body and rest. Today I woke up feeling pretty tired and a little nauseous. After I dropped Siena off at preschool I worked for a bit and then took a 2 hour nap at 10:30 AM. While I’ve made it a habit to exercise daily, I probably don’t need to put that pressure on myself to do so while pregnant with 7+ pounds of twins. They probably need me to rest more than the exercise at this point. There are many phases of life and I’m glad I’m accepting of the fact that this is simply a short phase where my workouts are going to look different. I feel surprisingly at peace with my decision to quit running, even though I know I may not be back at it for 10-15 more weeks. This is the last time I’ll ever be pregnant – I have the rest of my life to achieve fitness goals! To my moms, what activity was hardest for you to give up during pregnancy? You said it perfectly…listen to YOUR body and do what feels right for YOU 😉 You’re in such great shape, some time off to “gestate” will not hinder your overall fitness. You have been so active during your pregnancy and it’s been very inspiring! So great that you’re listening to your body and making changes as your pregnancy progresses. You’re one inspirational mama! you are really quite the example of a healthy, active mom. I love it! Sounds like you are really smart about your pregnancy and fitness! I love how you were able to run up until now. The countdown is on! It sounds like you have a great handle on how to make it all work through these last weeks! Great job. I wasn’t on any kind of exercise regime when I was pregnant, but I’m sure if I was, I would have given it all up so quickly, because I was sick almost the entire time. Really, really sick. I could barely make it to work some days, let alone go to a class or out for a run. I took one prenatal yoga class and got sick and almost passed out from low blood pressure. I was a hot mess. But everyone is different and hey. Now I’ve got it back together! You are amazing! I’ve loved following your journey so far. I know it can be tough to give up the workouts you love, but definitely trust your gut. Hope the rest of your pregnancy goes smoothly! You continue to look (and feel) absolutely amazing! 30+ weeks! Woo Hoo!!! Wow, you are amazing! You are 30+ week pregnant but yet you are running it sound good, but now just listen to your body and if you think walking and hiking will be better then running for you now then do so. I guess running will be hectic to you now. But really you’re one inspirational mama!